Since I gave a peek inside Chloe’s room yesterday when I showed you her DIY curtains, I thought I’d give a quick update and some details I hadn’t mentioned before. Her bed is an old one my mother used to have in her guest room. The trundle bed is from my brother’s childhood bed. We put them together and painted them white to update the look. We also changed out the handles with something much more chic. 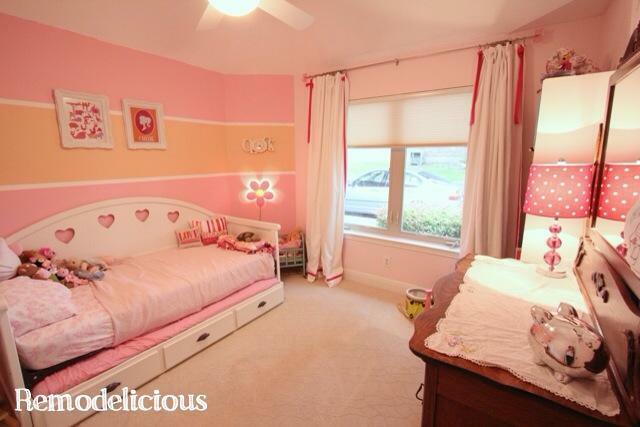 The artwork over her bed is Photoshop DIY inspired by designer prints in inexpensive white painted Hobby Lobby frames. I had the artwork printed in the Costco photo center for a professional look. The doll-e crib is vintage and was originally my mothers, then mine. We bought another one for Cora. It’s the perfect spot of store dolls and toys. Over it, there’s an IKEA kids nightlight. It gives off a warm glow, perfect for keeping the room fairly dark yet monster-free. Plus, the switch is low and easy for her to reach. 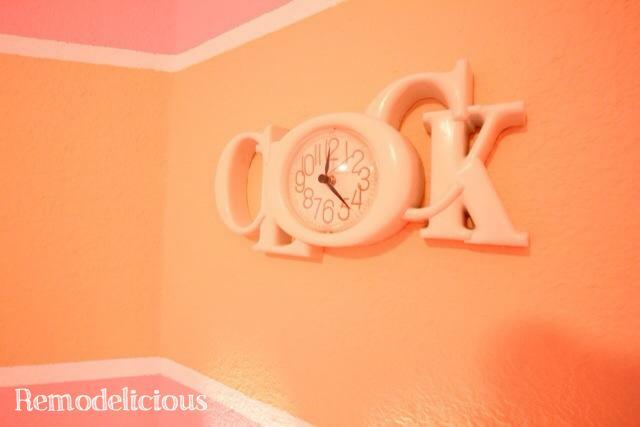 Over the doll crib & night lamp we have a vintage clock that I randomly found on eBay when searching for something completely different. It reminded me of “Word World”, one of Chloe’s favorite shows. She loves it. The dresser is vintage, found on Craigslist listed by an antique dealer. We put a vintage linen on top to help protect it. The lamp is from Home Goods. Bed pillows are from Dillards & Pottery Barn Teen. I find that teen-targeted items tend to bridge the gap between bright, kid items and more elegant adult ones. 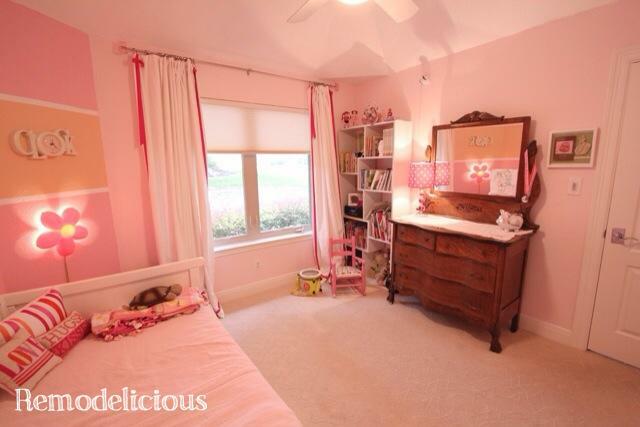 I once received the compliment that we had one of the best “kid houses” someone had seen. I credit details like this for making kid items look fun, but less Fisher-Price. 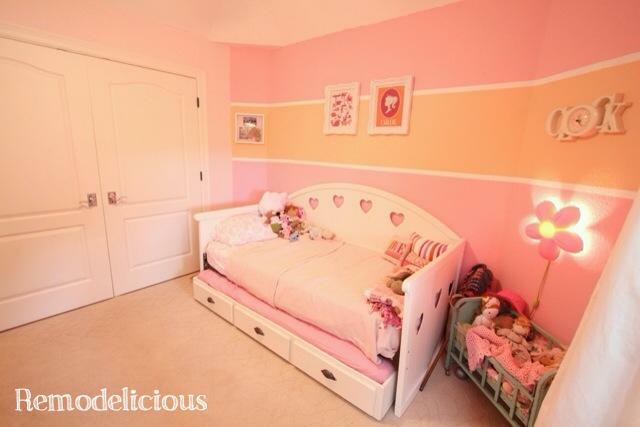 Her shelf was built by my father for Chloe’s nursery based on a design I drew. I love how the different geometric shapes create different shaped cubbies and allow for more than just books on the shelf. 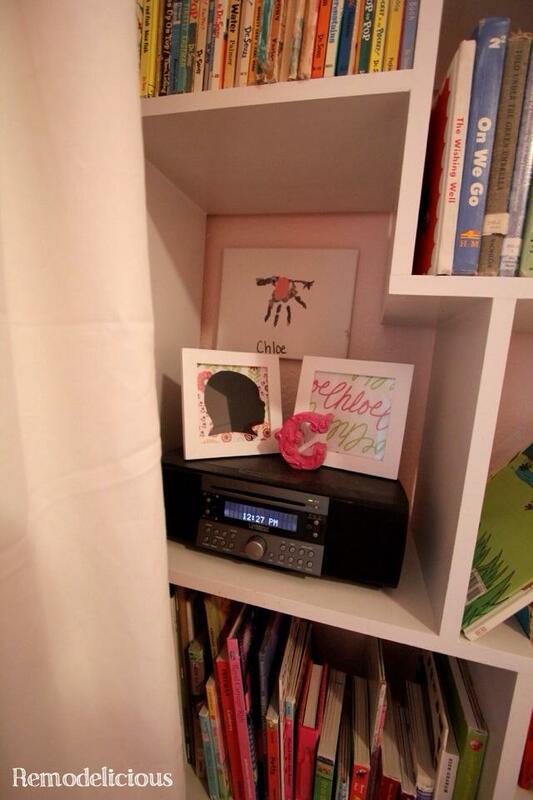 I’ve added some artwork that Chloe did in a section with her radio (for listening to her princess CDs) and some art that I had made for her nursery. 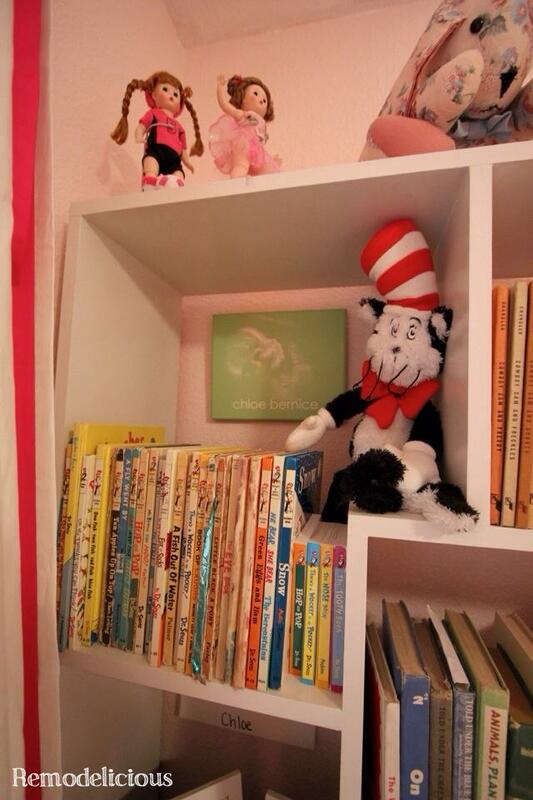 Gotta love the Dr. Seuss shelf! My mother saved vintage Dr. Seuss books and we added a few new board books for the little ones to hold themselves. 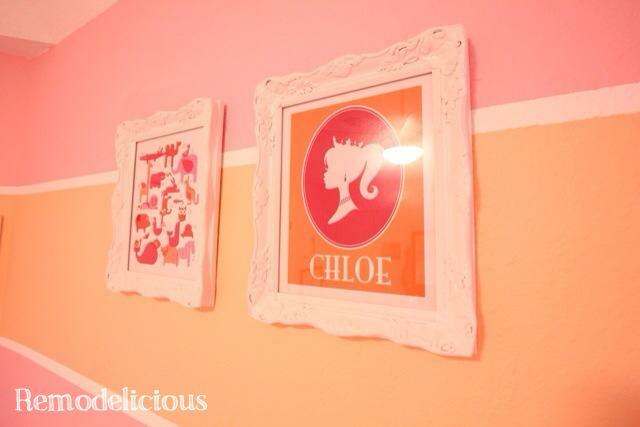 I hung another item from Chloe’s nursery here, a canvas I DIYed in Photoshop with her ultrasound photo. Hanging these small items within another item give a less cluttered look than having a ton of small items all over the wall.